Discussion in 'Guitars in General' started by idnotbe, Apr 22, 2016.
i saw a few guitar makers use only 2 screws (not 4) in the neck pocket heel for their bolt-on guitars. what's the benefit of 2 screws? why do they use only 2 ?? here are the neck pocket heel pics of tom Anderson and ted stevenson. One that comes to mind is less distortion of the fingerboard in that area. Some call it the Fender hump and not all get badly distorted but some do and require additional fret leveling in that area due to the four big wood screws distorting the neck. I wonder if Anderson is using two wood screws or two machine screws? If you have a design that only requires 2 screws, why would you use more? Christopher Winkels and southpawshooter like this. Andersons use a tapered heel joint now that locks extremely tight. 2 screws is more than enough just to pull the heel into its joint on the body. Doesn't Taylor do it with one bolt? Leo got it right the first time, EOS. In the case of Ted Stevenson guitars, there are only two screws, but there are not the only anchoring system holding the neck in place. His fastening system is actually more solid and stable than four screws. That must be why so many Fender guitars need shims, right? That Anderson A-Wedge joint is amazing. It's a joy to play. I've heard different theories about the hump or ramp on some Fender-type bolt ons. One that makes sense to me is that the strings pull and compress the fibers in the neck, except once they hit the neck joint. That area is fixed to the body and not subject to the same amount of stress. So the fibers kinda bunch up right around that spot. I've experienced with first hand with a neck that was freshly leveled but played terrible. Turned out that under string tension, a hump appeared right there. Maybe the screws can be a separate source of distortion. I dunno. Erlewine's fret jig supposedly holds the neck in that distorted position after the strings are removed so that the frets can be leveled correctly. I've thought about buying one. Correct. And their neck/body join is also tightly machined to the ten-thousandths. In other words, if the design and execution are such that all one needs is x screws, then having more not only defeats the purpose but may even yield unintended negative consequences. Yup. I believe a similar jig was used. I think it used straps pulling around the headstock to simulate having the strings yanking on it. That neck was driving me crazy but it's all sorted out now. I've never played one , it looks like a great idea . I've experienced this same phenomenon as well. My guitar guy levels the frets and then spends a little more time on the tongue end after it's under tension. It makes a HUGE playability difference! This is necessary on over half of the Strats I see. You don't need much clamping force - a string set is what, about 125-150lb total tension, of which nearly all of it is pulling the neck into the body. The screws only have to deal with the moment at the pocket's end, which a single screw could handle. I reckon Leo wanted the extra screws to reduce lateral shifting; since manufacturing tolerances were/are insufficient to perfectly locate the neck in the pocket, lots of clamping force was the cheapest/simplest alternative. Anderson, et al, have solved the locating issue, so no longer need a ton of clamping force. The Anderson has 2 screws because it works better for that joint, which isn't a normal boxy flat neck joint. That neck is NOT moving back and forth. Period. In practice... better than any standard 4-bold neck joint on any guitar I've had. I do find that as you tighten the 4 fender bolts the last little bit... things change. Even the order you tighten them if you have a shim under makes some difference. So not sure I'm sold on 2 screws. 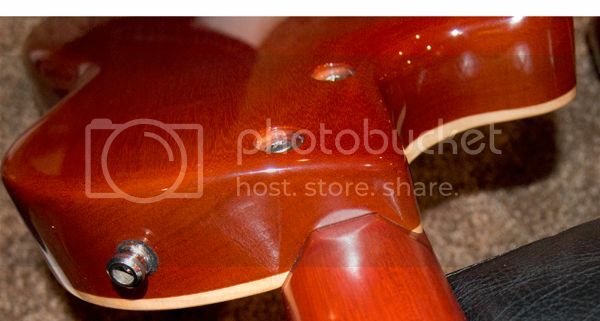 I wonder if you tried to slip a couple thousanths feeler gauge between the neck and the body on that guitar in pic #1 (on the side with no screw close) if it would go in? I cant tell, but if it's not a flat pocket and a wedge shape, it would be fine I would think. Flat Fender style pocket... maybe not.